Established in the year 2004, we “Adhisakthi Projects private Limited ", is an ISO Certified Company, offering Industrial Machinery andAutomation's . We are a unique company focused towards manufacture of complete range of machineries required for the health and beauty care industries viz. Pharma, Cosmetics, Foods, Soaps & Detergent industries and Packaging sector. Our machineries are branded in the name Adhisakthi which reflects creativity commitment and customer satisfaction. The product ranges from processing equipments to packaging machineries. We are unique, because we offer a one stop solution for every need of the above industries. We are the only company to provide end to end solution for a fully automated factory which includes the following sequence of operation. Processing Equipments (Cream Mixers, Planetary Mixers, Homogensiers ,Sigma Mixers, Ribbon Blenders, Plodders etc). 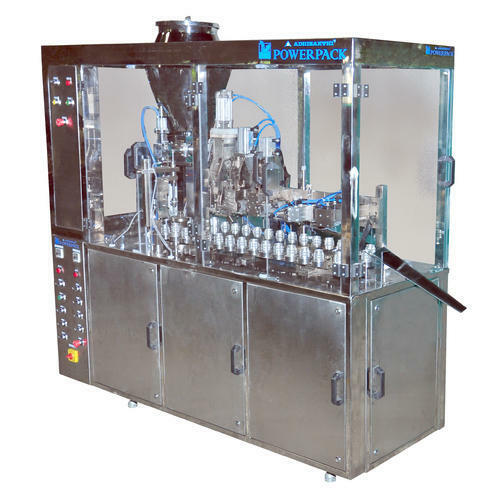 Packaging Machinery (Tube filling machines, Powder fillers, VFFS, Bottle filling & Capping machines,Spout Pouches Filling). Material Handling (Screw conveyors, bucket elevators, Pneumatic elevators, belt conveyors etc). Turnkey Projects (Cream & Ointment plants, Liquid plants, Soaps and detergent plants etc). Mixing (Sigma mixers, Ribbon blenders, Semi contra – Contra - planetary mixers Liquid mixers). Storage (Storage tanks ( MS/SS ), Bulk bag handling and unloading Systems. Research and Development (Pilot plants for formulating your products). Thus we are providing a fully automated facility for the every need of industries ,which is the order of the day. We undertake projects on a turnkey basis and execute under one umbrella. The biggest strength is our innovative team, own manufacturing facility fully equipped with the state of the art design software, CNC machines, and modern manufacturing practices. We have a very strong and reputed customer base which illustrates our credibility. We have 60 + machinery categories, 600 + Time tested Models and 6000 + Installations worldwide. We are the only one stop solution for complete range of machinery for the every needs of industry in the country.